The Medieval Convent Drama project directs new critical attention towards the theatrical work and multiple creative, performative activities undertaken by women within medieval convents. Focusing on women’s religious houses in England, France and Burgundy, we seek to deepen critical understanding of this neglected tradition. We are based at the University of Fribourg, Switzerland, and are fully funded 2016-2019 by the Swiss National Science Foundation (Fonds National Suisse). 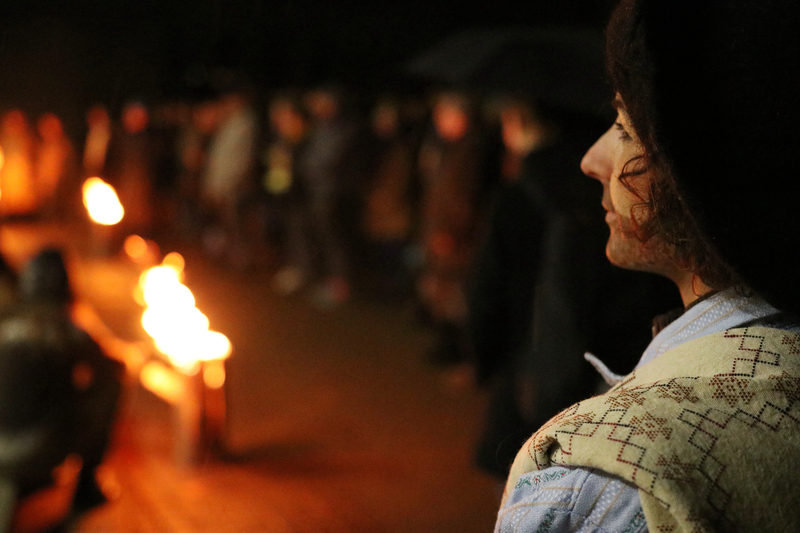 Project researchers Aurélie Blanc and Liv Robinson participate alongside our performance group in the Barking Abbey Harrowing of Hell and Visit to the Tomb at the Abbey of la Maigrauge, Fribourg, April 2018 (dress rehearsal). 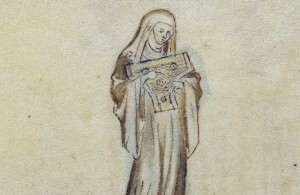 Our team integrates archival, codicological and literary research methodologies with public performances and practice-based investigative techniques to explore the wide range of theatrical and performative activities undertaken by women religious in French, English and Latin during the Middle Ages. 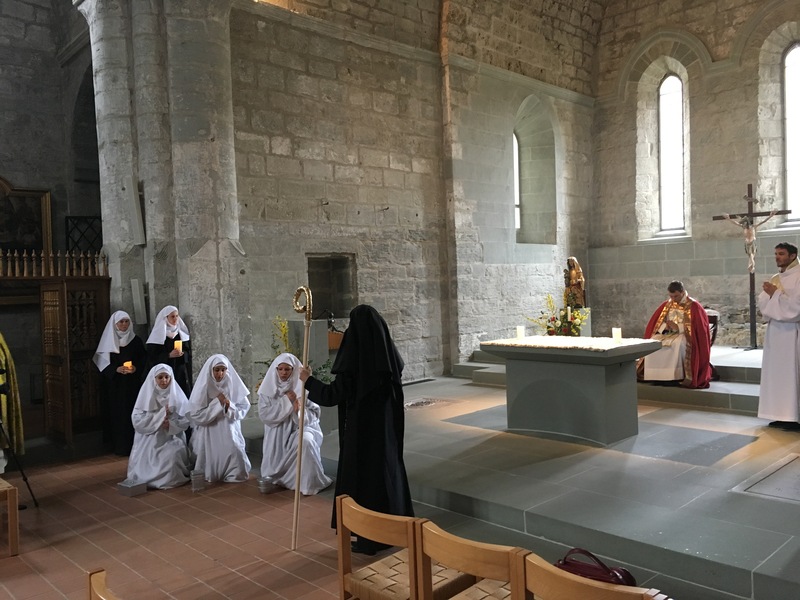 We work closely with present-day convents in Switzerland and Belgium, exchanging knowledge, staging medieval convent drama within convent architectural spaces, and discussing our performances with sisters within these female religious communities. 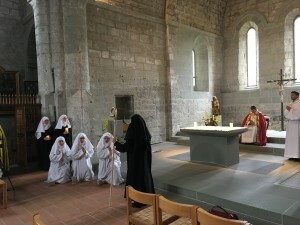 To date, our convent partners include: the Carmel of OLV Ten Troost, Vilvoorde; les sœurs de Sainte-Ursule de Fribourg; the Carmel du Pâquier and the Cistercian Abbey of la Maigrauge. We have also collaborated with members of the local Dominican friary at the Albertinum, Fribourg. For project updates, information about upcoming performances, and our other events, please see our blog. For our YouTube channel, with films of our performances, click here. Recent research into medieval English drama has emphasised possible roles played by women in the consumption, production and dissemination of theatre throughout the Middle Ages. The publication of documentary evidence for dramatic productions undertaken by REED (Records of Early English Drama) for example, has yielded important archival evidence of female participation in dramatic performance during the period before the first commercial playhouses were built. An even greater body of evidence of female participation in drama exists from mainland Europe. Nonetheless, medieval drama, particularly Biblical drama, is still widely seen as composed, copied, performed, and produced almost exclusively by men. Where the involvement of women in dramatic production is acknowledged critically, it is often as an exception to the rule, a marginal aberration. This project seeks to overturn some of these assumptions and biases, directing new critical attention towards the theatre composed, copied and produced by medieval women religious. Very little convent drama survives from England – the most comprehensive records we now have are those of the Visitatio Sepulchri and Harrowing of Hell drama from Barking Abbey (briefly described by Normington, 2009, Young 1933) and the Vistatio Sepulchri of Wilton Abbey (both Benedictine women’s houses) : the rarity of surviving plays probably partially explains the relative lack of critical attention paid to English convent drama as a genre. However, the lack of surviving evidence does not indicate that medieval convent drama was rare; rather, evidence did not survive the Reformation in England. In Europe, by contrast, many accounts of convent drama, and many dramatic scripts, survive; examination of this material may increase our understanding of both English and French-language plays by and for nuns, as well as of convent drama across Europe. Commentators on civic plays from medieval England have explicitly stated that the most useful analogues may be found in contemporary continental material (eg Spector, 1991 and Granger, 2009); if the routes by which, for example, French drama or Dutch literature exerted an influence on English theatre cannot always now be precisely defined, the influence is nonetheless clear. It is also unsurprising since there were, throughout the Middle Ages, political, cultural and commercial links among England, France and Burgundy/The Low Countries (see, eg, Butterfield, 2009 for the impact of these networks on literary production). Religious orders provided some of the strongest networks through which ideas and texts could be transmitted. The close study of surviving plays that were copied, read, performed and composed by nuns within medieval convents suggests questions relevant to understanding medieval dramatic and devotional practices more broadly. For example: how is a play defined as such? Convent drama survives in many manuscript forms and contexts: some plays are presented following the generic and codicological conventions we associate with the mise-en-page of medieval play-scripts; others survive as sequential prose descriptions which might function as stage directions for actors. Are such descriptions ‘plays’, or ‘drama’? Some convent plays are scripted elaborations on passages of liturgy; some borrow innovatively from the liturgy in otherwise vernacular dialogue; the project will necessarily engage a long-standing critical debate: when does the liturgy become theatre? It seems likely that drama could be a devotional act, requiring imaginative participation in a role played akin to the engagement required of contemplatives by, say, the Ancrene Wisse or Rolle’s Meditations. Such drama might not require an audience, or might be played out within a religious community. What role did performance play within an enclosed context? Who would act, and were scripts modified by or for performance? In some cases, it seems that nuns did perform for lay audiences: what role did performance play for this local community? How did music – particularly the music associated with the liturgy – function when re-positioned in a dramatic context, and performed as part of these plays? The project will approach these questions through the particular lens of an understudied female dramatic tradition. Butterfield 2009. Ardis Butterfield, The Familiar Enemy: Chaucer, Language and Nation in the Hundred Years’ War. Oxford: OUP. Granger 2009. Penny Granger, The N-Town Play: Drama and Liturgy in Medieval East Anglia. Cambridge: D. S. Brewer. Normington 2009. Katie Normington, Medieval English Drama: Performance and Spectatorship. Cambridge: Polity Press. Spector 1991. Stephen Spector, ed., The N-Town Play. EETS ss 11: 2 vols. Oxford: OUP. Young 1933. Karl Young, The Drama of the Medieval Church. 2 vols. Oxford: Clarendon Press.